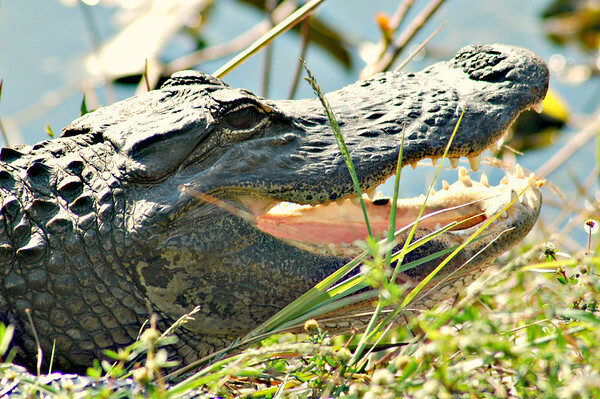 Everglades National Park is spread out over 1.5 million acres in south Florida. The park has four visitors centers as shown on the map below: Gulf Coast, Shark Valley, Ernest F. Coe, and Flamingo. The Gulf Coast Visitor Center in Everglades City is the gateway to the western area of the park known as the Ten Thousand Islands. 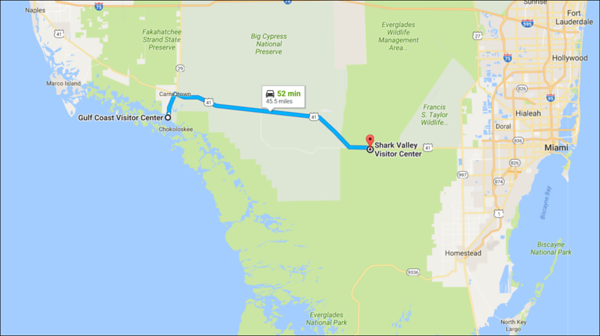 The Shark Valley Visitor Center is all by itself off of U.S. Hwy 41, and is the access point to a very small, wildlife-rich area of the park. The Ernest F. Coe Visitor Center is southwest of Homestead, Florida and greets visitors arriving on the eastern side of the park. 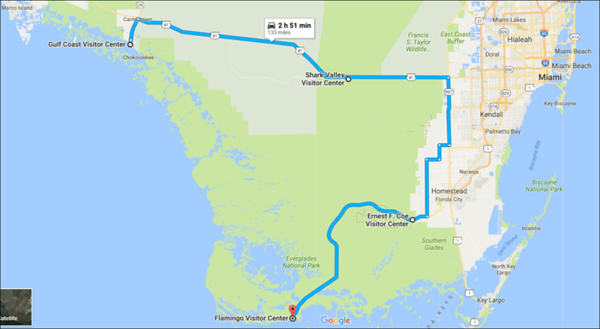 The Flamingo Visitor Center is 38 miles past the Ernest F. Coe Visitor Center and is only accessible by the two-lane road traversing the southern section of the park, or by boat as it sits on the Florida Bay. This post provides highlights from our first visit to Shark Valley in March 2006. Today we traveled down from Naples, Florida on the Gulf Coast to Everglades National Park, our first visit to the Everglades together. Our goal was to check out the Gulf Coast Visitor Center in Everglades City. Well, we were surprised to find that there weren't even signs to the visitor center anywhere along the road or in town. We eventually found it, and then learned that there isn't much going on there and it's not really in the Everglades. It's just there to provide information to those that want to access the Ten Thousand Islands area by boat. We stayed about ten minutes and decided to continue the 45 miles east to Shark Valley. Shark Valley has a little visitor center/gift shop and a 15-mile paved trail loop that you can walk, bike, or ride via a tram. Most people take the tram, but we decided to walk a little ways and one of the rangers gave us a tip on doing about a mile and a half. Before we got started, we heard squawking right by the visitor center. 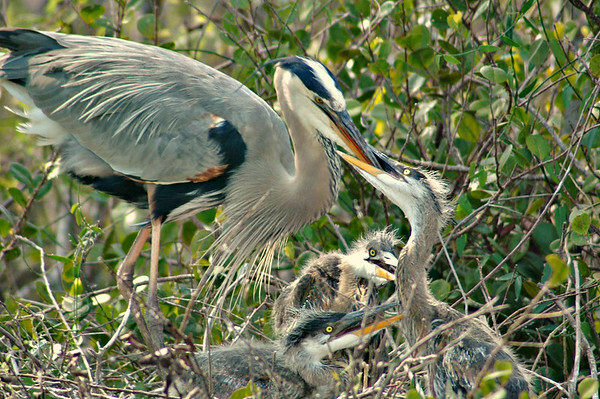 As we walked over, we saw a Great Blue Heron with three 3-week old babies in a nest maybe forty feet away. They were being fed. 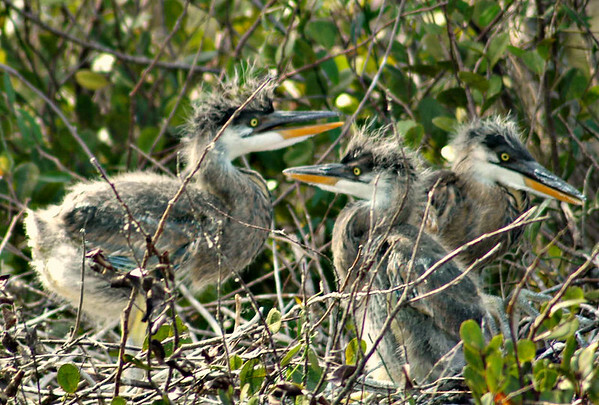 We've seen a lot of Great Blue Herons, but a nest with chicks was a first. That was a good start to our walk. 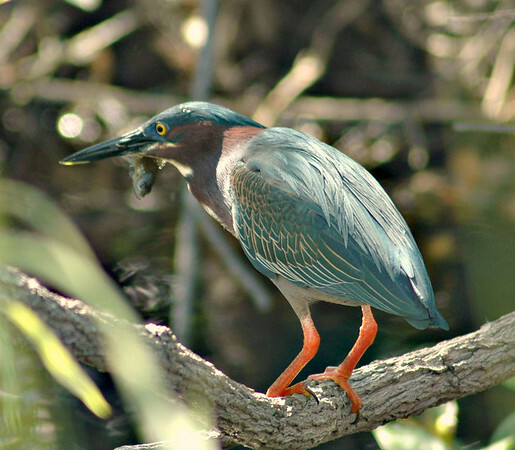 The ranger back at the Gulf Coast Visitor Center told us that Big Cypress National Preserve and Shark Valley had artificially enhanced the wildlife viewing by introducing fish into their waters. 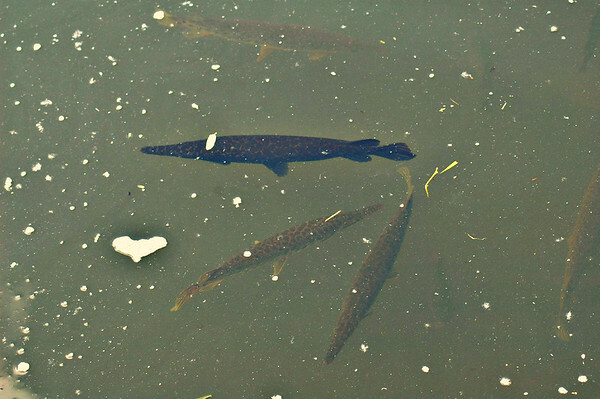 The fish thrived and naturally attracted fish-eating animals. I don't know if that's true, but even if it is, all the wildlife is still free to come and go as it pleases. 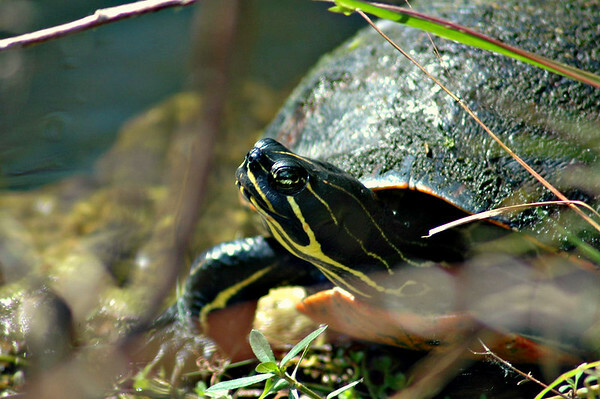 and some exotics that are not native to the area such as walking catfish, oscars, and tilapia. But the birds and alligators seem to like them. We started our walk down the paved road and there was a gator lying right beside the pavement. Beyond the alligator, we saw lots of fish, birds, and more gators. and then displaying its catch. 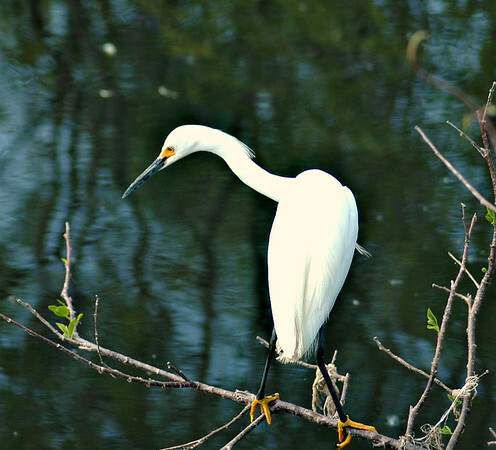 A beautiful Snowy Egret with its yellow feet. It was fun watching the different methods the birds used to feed. 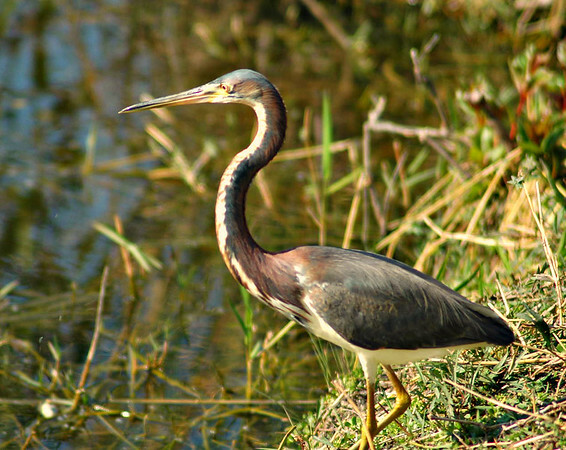 The Great Blue Herons and the Great Egrets waded, stalked, and stabbed. ... watched from the bank, then flew over the water grabbing tiny fish as they went by. Then they did the same thing from the opposite bank. The Anhingas dove and speared. 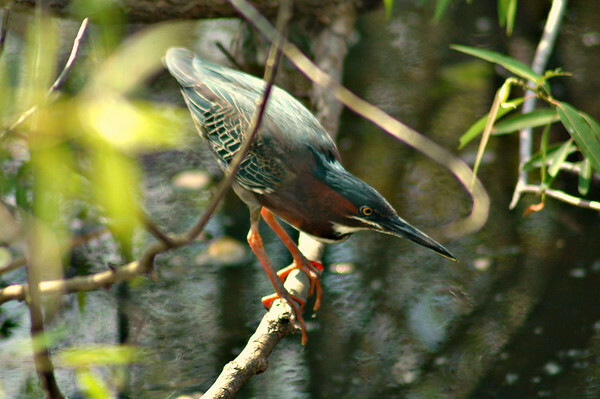 The Green Herons perched on a low branch over the water (as demonstrated in the prior photo), stretched their neck, and stabbed small fish. It was pretty cool to witness. 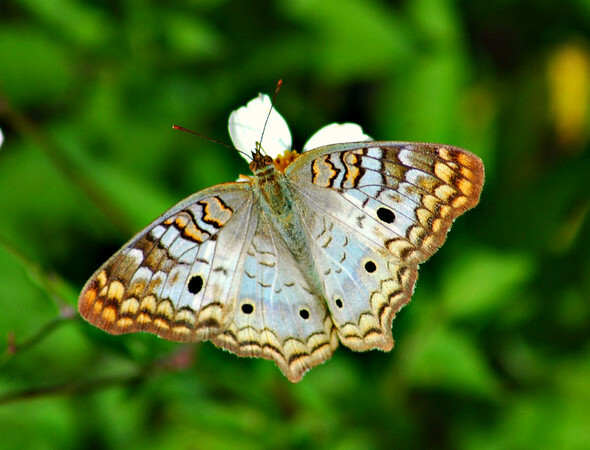 Here is a lovely White Peacock Butterfly. 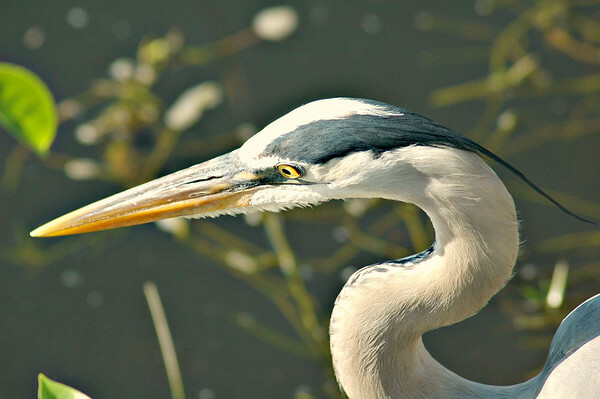 And finally, here is a close-up of a Great Blue Heron. We loved how close we could get to all the animals as they hung out along the narrow canal. Today was just a taste, and we decided we would definitely bring our bikes back and ride the entire loop someday. Shark Valley got our attention.